During the course of a recent investigation carried out by members of the Asociacion Peruana de Ufologia (APU), contact was made with the new owners of strange archaeological relics of supposedly alien origin, who have been given the pseudonym "Guardians of Atok Marka" in order to safeguard the identities of these people who live in the southern mountains of Peru, where they have over 2000 of these strange relics in their possession. As will be recalled, in late 2016, two characters from the city of Cuzco - "Luis Quispe" or "Krawix" as well as Dante Rios, brought some of these remains to light, which added up to a dozen, and which included small mummified beings, skulls of extraterrestrial (sic) appearance, as well as giant hands with metallic incrustations. But in this case, the "Guardians of Atok Marka" have a much larger number of pieces, some of them similar to those held by the collectors in Cuzco, along with many other relics, each more intriguing than the previous one. The "Guardians of Atok Marka" have over 2000 pieces in their possession, as was mentioned earlier. Among these are the mummified remains of entities ranging from 7 centimeters to 3 meters tall (3 inches to 9 feet). Upon detailed observation and contact by APU researchers, everything pointed to these objects being bones and soft tissue mummified with the passing of time and the conditions in which they were found. When the existence of these remains in the hands of the collectors from Cuzco became known, all of these parts had been removed in a clandestine manner from a subterranean gallery located under the Ica Desert, specifically the Nazca Area, a province located to the south of the region. According to the story offered by the "Guardians of Atok Marka", these remains were removed from a sacred site, protected by ancestral tutelary spirits for thousands of years, and which had never been located by the archaeological work being carried out at various locations of Nazca Province. 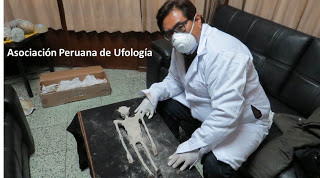 The Asociación Peruana de Ufología awaits the results of scientific tests that have already been commissioned by the "Guardians of Atok Marka" from a specialized organization with a view toward reaching a more satisfactory conclusion as to the origin and authenticity of these enigmatic relics. However, everything seems to suggest that we could be facing evidence of transcendental importance that would definitely change the course of humanity. Dr. Anthony Choy, APU's director, and Lic. Rafael Mercado, e representatives of the Asociación Peruana de Ufologia, are the first Peruvian researchers to reach the guardians of this priceless and impressive collection of over 2000 pieces of seemingly non-human origin. The completion of the scientific tests being performed on them is crucial. It is also necessary to keep this subject from being distorted or manipulated by shadowy political interests. The Asociación Peruana de Ufología shall continue to pursue this case.